Vince Cusimano (left) rehearses his part next to Amir Khalighi for the play “It’s A Wonderful life – A live radio Play” by Joe Landry. At the Pierce College Performing Art Complex On Monday, Dec. 12 2013. Photo: Nelger Carrera. A holiday classic is given a relatively modern take with “It’s a Wonderful Life: A Live Radio Play,” performed as a 1940s live radio show, and is opening Friday at Pierce College’s Performing Arts Complex. 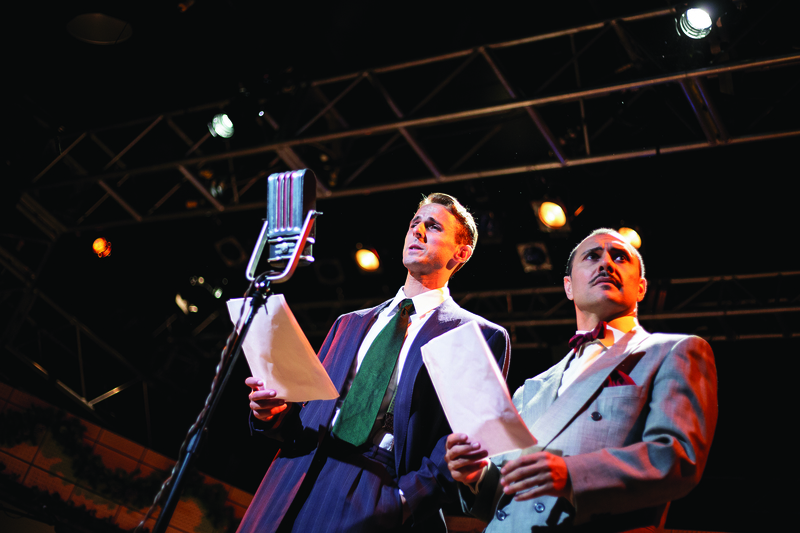 The play follows the story of the original film, but the stage is set in a radio station where the actors perform to the crowds listening to their radios at home — this was before the spread of television. The foley artist, who performs the special effect sounds that would be needed for the purely audial experience that the play reenacts, is played by Michelle Hallbauer. The six other actors (Vince Cusimano, Shannon Mary Dixon, Mark Hen, Amir Khalighi, Michele Selin and Matti Lenora Werber) will be playing as the actors in the show, portraying multiple characters and changing their voices to suit. Sande says that the cast and crew have been preparing since they received the rights to perform the show, which was something that was difficult to acquire. The popularity of the show meant that Pierce’s theater department had to compete with every other theatre in the Los Angeles area, professionals included. Only one production can be done in the county at the same time, according to Sande. “We were very lucky to get it,” Sande said. The director, Frank Catalano, made a few changes to the original script, which was encouraged by the playwright, according to Sande. The most notable addition is a singing group called The Clarinda Sisters, who are modeled after The Andrew Sisters, a popular group from the time period of the play called. This is the first time something like that was added, according to Sande. The Clarinda Sisters of the show are played by Michaella Landers, Kristine Jhing Sillona and Julianna Sillona-de Leon. The show opens on Dec. 6 at 8 p.m., and will continue through that weekend and the next. Saturday and Friday shows are at 8 p.m. with Sunday shows at 2 p.m.
Tickets are $12 for students and seniors, and $15 for general admission. To purchase tickets or more information, call (818) 719-6488 or go to LAPCTheatre.brownpapertickets.com.